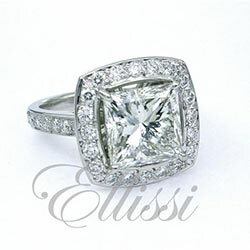 Pave’ set shoulder diamonds compliment this princess cut diamond. With a curved rounded profile band this ring is very comfortable on the finger. The central setting has 4 claws in the cross wire layout. Shown here in 18 ct white gold. 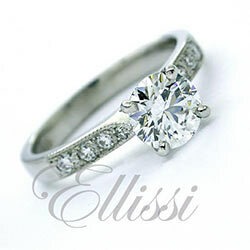 A matching pave’ set wedding ring is also available.